Saving Britain’s hedgehogs - one village at a time When was the last time you saw a hedgehog? It seems for more and more of us the answer is ‘years ago’, before we recall hearing them ‘snuffling’ around our gardens in search of food and water. Grace is a rescue hedgehog from Harper Asprey Wildlife Rescue who has inspired a ‘rock star’ to help save Britain’s hedgehogs. Windlesham - The ‘Hedgehog Friendly” Village The Surrey village of Windlesham was originally a farming outset of the Great Windsor Park. The village took its name from the River Windle running to the south of the village and the old english word, ham, meaning homestead. For those who would like to do more an Amazing Grace Hedgehog Officer is ... to win a framed hedgehog print signed by Queen legend Brian May in the raffle. Steve Backshall helps healed hogs back into the wild. Queen legend Brian May spoke to youngsters about his fight to save the UK's hedgehogs during a visit to an infant school today. Everyone loves a hedgehog – especially rocker and wildlife nut Brian May. 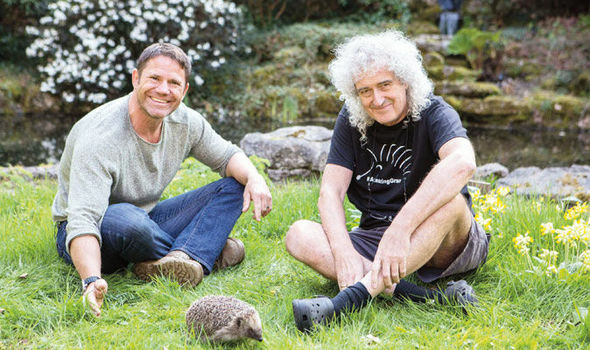 QUEEN guitarist Brian May and naturalist Steve Backshall team up to save Britain’s hedgehogs. He may be a rock god, but Queen guitarist Brian May is also an animal campaigner of note. Already famous for fighting against fox hunting and the government’s badger cull, last year Brian set up a hedgehog charity, Amazing Grace, in Windlesham, Surrey. The reason? Hedgehogs are in catastrophic decline in the UK. Sixty years ago it was estimated that 30 million hedgehogs called the UK home; now only about a million remain. Loss of habitat as a result of overdevelopment, the use of insecticides that kill their food, a penchant for fenced-off lawns that prevent them roaming, and collisions with cars and lawn strimmers are mostly to blame. Determined to help, last year Brian teamed up with Anne Brummer of Surrey’s Harper Asprey Wildlife Rescue. They’d already launched the Save Me animal rights campaign in 2009 to fight fox hunting and badger culls, and now they’ve set up Amazing Grace. Rock god to hedgehog hero is an unlikely trajectory… “I’m not a hero. I just do what I can,” demurs Brian. Brian sprinkles stardust on this week’s Channel 5 documentary Meet The Hedgehogs, presented by Steve Backshall, which highlights the charity’s work, reveals what we can do to make our gardens hedgehog friendly, and generally celebrates the UK’s only spiky mammal. Anne and her team at Harper Asprey rescue about 750 hedgehogs every year and provide round-the-clock care in nursing them back to health. But Steve also meets private individuals who’ve dedicated their lives to helping the little creatures. Since 1980, Elaine Drewery, an OAP from Authorpe, Lincolnshire, has turned her house into a hedgehog sanctuary, funding their care with her pension and donations. Even London’s parks used to be a hedgehog haven. “Hedgehogs used to be a common sight in all London’s parks, but now there’s just one breeding population left, in Regent’s Park,” explains Steve. Helping them keep hydrated is an important first step, says Brian. “So many of the hedgehogs that come in [to the centre] are dehydrated, so if you’re going to put something out for them, put out a dish of water,” he says. Also, provide food such as cat food, dog food, nuts or raisins, but not milk or cheese – hedgehogs are lactose intolerant. Other hedgehog-friendly tips include cutting a hedgehog-sized hole in the bottom of your garden fence, providing them freedom to roam, because hedgehogs can cover several kilometres per day in their search for food. Steve is hopeful that ordinary Brits can help prevent the extinction of a species that, last year, topped a poll by the Royal Society of Biology as Brits’ favourite mammal. A visit from a popular TV presenter, a two-time Olympic rowing gold medallist and some prickly guests spiced up the build-up to a parish council meeting last night. Dr Brian May's hedgehog week kicked off yesterday with a meet and greet that was popular with residents. A Surrey village is aiming to become the county's first 'hedgehog friendly village'. Queen legend Brian May is once again backing Britain's hedgehogs ahead of Hedgehog Awareness Week. In assembly time today Year 3 to 6 were lucky enough to meet a very special visitor - GRACE THE HEDGEHOG! QUEEN legend Brian May is becoming king of the hedgehogs to stop the much-loved creatures from vanishing into oblivion. Dr Brian May's Save Me Trust and Harper Asprey Wildlife Rescue launch #AmazingGrace campaign to save Britain's Hedgehogs.